For my birthday last week, I got a really cool book about reptiles from my Aunt Holly and Uncle Mark. One of the animals that I learned about from this book is the big-headed turtle. These large turtles grow up to 40 cm long, including their unusually large tails. Their head is so big, that it can’t even fit inside its shell. They have a very powerful bite and will hold on for a long time, causing serious injury. Even though they live in rivers, big-headed turtles aren’t very good swimmers. However, they are excellent climbers and can climb up trees and rocks. They hide during the day and come out at night to hunt for snails, worms and fish. Big-headed turtles are found in fast flowing rivers and streams in China, Vietnam, Laos, Thailand and Myanmar. They are considered endangered due to over-hunting for their meat and for the pet trade. As they are very slow breeders, it takes a long time for their numbers to recover. Are there any other interesting facts that you would like to share about big-headed turtles? 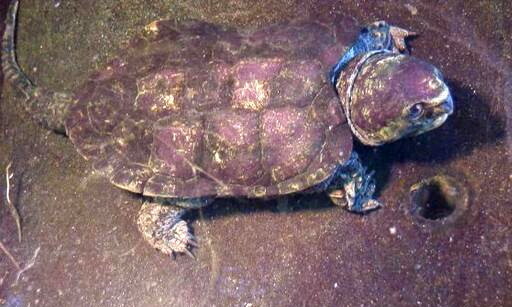 I like the Frog-Faced Softshell Turltle because I like how they lay 28 eggs!!!!!!!! I liked your turtle facts, and your fabulous blog. You are really smart and explorer-like. But turtles died because of climate changes, too. Poor these dudes. By the way, do hunters use their shell for sale?